Eddie Darwin Lacy Jr. (born June 2, 1990) is an American football running back for Green Bay Packers of the National Football League (NFL). He played college football at Alabama, where he was a member of three BCS National Championship teams, and was drafted by the Packers in the second round of the 2013 NFL Draft. Lacy attended and graduated from Dutchtown High School in Geismar, Louisiana. He ran for 1,207 yards and 13 touchdowns as a sophomore, 34 touchdowns as a junior, and 1 touchdown during his injury-plagued senior season. In December 2008, he was selected by the Louisiana Sports Writers Association as a first-team player on the Class 5A All-State football team for the second consecutive season. Rated as the 13th best running back and the 116th best prospect overall by Rivals.com, Lacy committed to the University of Alabama in February 2009. "2009 Alabama Football Commits". Scout.com. Retrieved April 23, 2013. "Alabama Crimson Tide". ESPN.com. Retrieved April 23, 2013. "Scout.com Team Recruiting Rankings". Scout.com. Retrieved April 23, 2013. A highly touted recruit, Lacy accepted an athletic scholarship to attend the University of Alabama, where he played for coach Nick Saban's Alabama Crimson Tide football team from 2009 to 2012. Lacy had three BCS National Championship victories in his collegiate career. Lacy was redshirted for his freshman year in 2009 on the Alabama Crimson Tide. In 2010, Lacy earned his spot as the third-string tailback behind Heisman Trophy-winner Mark Ingram and Trent Richardson. In the season opener against San Jose State, Lacy ran for 113 yards and two touchdowns in his collegiate debut. For the 2010 season Lacy finished with 406 yards rushing on 56 carries, an average of 7.25 yards per carry, and six touchdowns. With Ingram departing for the NFL, Richardson and Lacy advanced to the No. 1 and No. 2 running back spots for the 2011 Alabama Crimson Tide football team. In the pre-season, those close to the program opined that "the Richardson-Eddie Lacy duo may put up bigger and better numbers and go down as the best duo in recent history." Backfield partner Richardson told reporters that Lacy's spin move is what separates him from other backs: "It's the nastiest spin move ever." The move has earned Lacy the nickname "Circle Button" based on the button on PlayStation's video games that triggers a spin move. Aaron Suttles of The Tuscaloosa News wrote, "To the fans, Eddie Lacy is a dreadlocked blur, spinning past defenders into the secondary. To his teammates, he's affectionately known as 'Circle Button.'" In the 2011 season opener against Kent State, Lacy contributed 134 yards of offense- 76 receiving yards on three catches and 58 rushing yards on eight carries (an average of 7.3 yards per rushing carry). His 48-yard gain on a screen pass was the longest passing play of the game. Asked in a post-game press conference if he had hit the "Circle Button" a few times in the game, Lacy joked, "Yeah, I did a few spin moves." The Birmingham News wrote that Lacy "ran more impressively" against Kent State than the Crimson Tide's No. 1 running back, Trent Richardson. Another commentator led his coverage of the Kent State game with the headline, "Lacy, not Richardson, has look of Heisman-caliber RB in game one." After the game, head coach Nick Saban noted, "Eddie's a fast guy, an explosive guy." Photographs of Lacy hurdling over Kent State defensive back Calvin Tiggle were published in news outlets across the United States and in Europe, with one such image being chosen by Yahoo Sports as its lead "Photo of the Day." In the second game of the 2011 season, Lacy rushed for 85 yards in Alabama's 27–11 win over Penn State. In the third week, Lacy had the best game of his collegiate career, rushing for 161 yards and two touchdowns on nine carries against North Texas. His 67-yard touchdown sprint in the fourth quarter was picked as Alabama's Play of the Week. Against Arkansas, Lacy rushed for 61 yards and one touchdown on 13 carries. He sustained a foot injury against Arkansas and did not play the following week against Vanderbilt. During the 2011 regular season, Lacy had 631 rushing yards and seven touchdowns. His average of 7.5 yards per carry ranked sixth among all players in the NCAA Division I Football Bowl Subdivision. In 2012, he became the starting running back for Alabama, after the departure of Trent Richardson. His backup was true freshman T. J. Yeldon and both Lacy and Yeldon finished the year with over 1000 yards each. Lacy finished the 2012 season rushing for 181 yards and two touchdowns in the 2012 SEC Championship Game and 140 yards and one rushing touchdown, as well as one receiving touchdown in the 2013 BCS Championship Game. He was named the Offensive MVP for the BCS Championship game. Lacy finished the year with 1,322 rushing yards with 17 rushing touchdowns and 2 receiving touchdowns. On January 11, 2013, Eddie Lacy declared for the 2013 NFL Draft. Lacy was one of the top running back prospects in the 2013 NFL Draft, with a reputation for agility, strength and ability to run through tackles. Lacy playing in the 2014 Pro Bowl after his rookie season. Lacy was selected in the second round (61st overall) by the Green Bay Packers in the 2013 NFL Draft. On May 30, 2013, he signed a contract with the Packers. Lacy suffered a concussion against Washington Redskins on September 15, 2013. He returned against the Detroit Lions on October 6, 2013. In 2013, he rushed for 100+ yards in 4 games. He had a career high in rushing in a single game against the Bears, running for 150 yards on 22 carries with a 6.8 average. Lacy passed the 1000-yd season mark on December 15 against the Dallas Cowboys when he ran for 141 yards and a touchdown on 21 carries. Lacy finished the season with an impressive 1,178 yards and 11 touchdowns with 257 receiving yards. He set the Packer rookie records for most rushing yards and touchdowns in a season. He was named AP-Second Team All-Pro and was named to the NFC Pro Bowl. Eddie Lacy was selected as the 2013 Offensive Rookie of The Year, the first Packer chosen for the award since RB John Brockington in 1971. 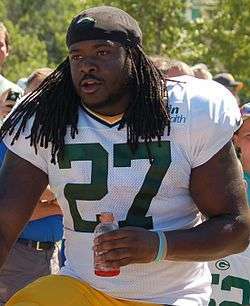 Lacy during the 2014 August training camp. The Packers 2014 season opener was against the Seattle Seahawks where Lacy had 12 carries for 34 yards and three receptions for 11 yards. Lacy sustained a concussion during the game and left the game in the second half. During the game Lacy wore the new SpeedFlex helmet by Riddell, which claims that the helmet absorbs impact force better due to the helmet's greater flexibility. Lacy had his first 100-yard game of the season in the fifth game of the season against the Minnesota Vikings, where he had 13 carries for 105 yards, 2 touchdowns, and also had 3 receptions for 27 yards in a 42-10 Packers win. After a slow start to the season, Lacy finished strong, ending the season with 1,139 yards rushing, with 9 rushing touchdowns, averaging 4.6 yards per carry. Lacy became only the second Packer ever to rush for over 1,000 yards in his first two NFL seasons, joining John Brockington. Lacy also caught 42 passes for 427 yards and 4 touchdowns. On September 20, 2015, Lacy left Week 2's game against the Seattle Seahawks with an ankle injury and did not return. X-rays were negative on Lacy’s injured ankle. The injury was classified as "minor." On November 8, 2015, Lacy left during the 3rd quarter with a groin injury in Week 9's game against the Carolina Panthers. On November 10, 2015 the Green Bay Packers declared Lacy inactive for Week 10's matchup against the Detroit Lions. On December 2, 2015, Lacy missed the Green Bay Packers' team curfew and his status was impacted on Week 13's matchup against the Detroit Lions. On October 20, 2016, Lacy was placed on injured reserve. ↑ "Griffin's Lacy named to 5A All-State first-team". Weekly Citizen (Louisiana). December 16, 2008. ↑ "Lacy headlines all-District 6-5A team". Weekly Citizen (Louisiana). December 30, 2008. ↑ Eddie Lacy Bio – ROLLTIDE.COM fee University of Alabama Official Athletic Site. Rolltide.Com. Retrieved on January 22, 2014. ↑ Tim Griffin (February 4, 2009). "Eddie Lacy opts for Alabama over Oklahoma". ↑ "Dutchtown RB Lacy leads prospects headed out of state". The Advocate (Baton Rouge, LA). February 5, 2009. ↑ Allen Wallace (February 23, 2009). "Why Eddie Lacy Chose Alabama". Scout with FoxSports.com on msn. ↑ University of Alabama Official Athletic Site – Football. Rolltide.Com (September 4, 2010). Retrieved on January 22, 2014. ↑ "Alabama overpowers LSU in National Championship 7". Associated Press. January 1, 2011. ↑ "Eddie Lacy". University of Alabama. ↑ Alabama Athletics Department, Eddie Lacy Bio. retrieved 5-6-2014. ↑ Larry Burton (January 18, 2011). "Why Trent Richardson and Eddie Lacy May Be Better Than Ingram and Richardson". BleacherReport.com. ↑ Don Kausler, Jr. (August 15, 2011). "Spin and control: Tide RB Eddie Lacy wants hands to catch up to his feet". The Birmingham News. ↑ Michael Casagrande (August 11, 2011). "Lacy taking his lapses of last year to heart". The Anniston Star. ↑ "Bama's Eddie Lacy focused". Times Free Press. August 11, 2011. ↑ Aaron Suttles (September 4, 2011). "Lacy offers change of pace". The Tuscaloosa News (TideSports.com). ↑ "Tide roll in opener against Kent State". Los Angeles Times. September 3, 2011. ↑ "Eddie Lacy Post-Game Kent State 9-3-2011". 247SportsStudio. September 3, 2011. ↑ Live updates: Alabama 48, Kent State 7, final. AL.com (September 3, 2011). Retrieved on January 22, 2014. 1 2 Erik Stinnett (September 3, 2011). "Bama-Kent State: Lacy, not Richardson, has look of Heisman-caliber RB in game one". Crimson Confidential. ↑ "ALABAMA RUNNING BACK EDDIE LACY (42) HURDLES KENT STATE DEFENSIVE BACK CALVIN TIGGLE (8)". EuroSport.com. September 3, 2011. ↑ "No. 2 Alabama downs Kent St. 48–7". Denver Post. September 3, 2011. ↑ "No. 2 Alabama downs Kent St. 48–7". USA Today. September 3, 2011. ↑ "Photo of the Day". Yahoo Sports. September 3, 2011. 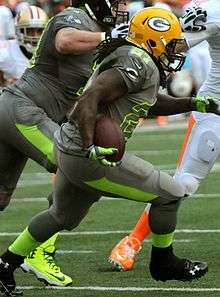 ↑ "Dutchtown product Eddie Lacy scores twice in Alabama victory". Weekly Citizen. September 20, 2011. ↑ Brian McAlister. "Eddie Lacy's long touchdown is Alabama's Play of the Week". al.com. ↑ Laura Owens (October 12, 2011). "Lacy returns to practice, Tide prepares for Ole Miss". The Crimson White. ↑ "NCAA Division I-A Player Rushing Statistics – 2011 (Yards Per Rush Attempt Leaders – Qualified)". ESPN.com. Retrieved November 27, 2011. ↑ 2013 NFL Draft best available: Eddie Lacy, Giovani Bernard can be 1st RB selected. SBNation.com. Retrieved on January 22, 2014. ↑ Eddie Lacy Draft Profile. Nfl.com (February 13, 2013). Retrieved on January 22, 2014. ↑ "NFL Events: Combine Player Profiles - Eddie Lacy". NFL.com. Retrieved August 31, 2016. ↑ "Eddie Lacy - Alabama, RB : 2013 NFL Draft Scout Player Profile". NFLDraftScout.com. Retrieved August 31, 2016. ↑ "Eddie Lacy Draft Profile". NFL.com. Retrieved August 31, 2016. ↑ "Packers sign RB Eddie Lacy". Packers.com. May 30, 2013. Retrieved October 20, 2016. ↑ Eddie Lacy injury update: James Starks looks like a nice fantasy play. SBNation.com. Retrieved on January 22, 2014. ↑ "NFL Week 2 injuries: Eddie Lacy X-rays negative". USA TODAY. Retrieved 2015-12-05. ↑ "Ian Rapoport on Twitter". Twitter. Retrieved 2015-12-05. ↑ "Lacy's struggles continue, exits with groin injury". ESPN.com. Retrieved 2015-12-05. ↑ "Eddie Lacy inactive for Week 10 vs. Lions". SBNation.com. Retrieved 2015-12-05. ↑ "Eddie Lacy disciplined for curfew violation in Week 13". NFL.com. Retrieved 2015-12-05. ↑ "Packers place RB Eddie Lacy on injured reserve". Packers.com. October 20, 2016. Retrieved October 20, 2016. Wikimedia Commons has media related to Eddie Lacy.